Diverticulitis or Verticulitis (a common term that people use for this condition), can be a pain – literally. This gastrointestinal condition is actually quite common after age 40 and may be present for some time without causing any problems, but when inflammation or infection strike, it’s a different story. Self-management is often the key to dealing with diverticulitis and may help you avoid the last-resort option of surgery. In a nutshell, here’s everything you need to know about di-verticulitis. Diverticula are pouches that form in weak spots in the intestinal lining. The individual pouches are called diverticula, while the actual condition is called diverticulosis. Typically found in the colon, or lower part of the large intestine, diverticula may trap undigested or partially digested food particles, which can irritate the bowel or set the stage for an infection. 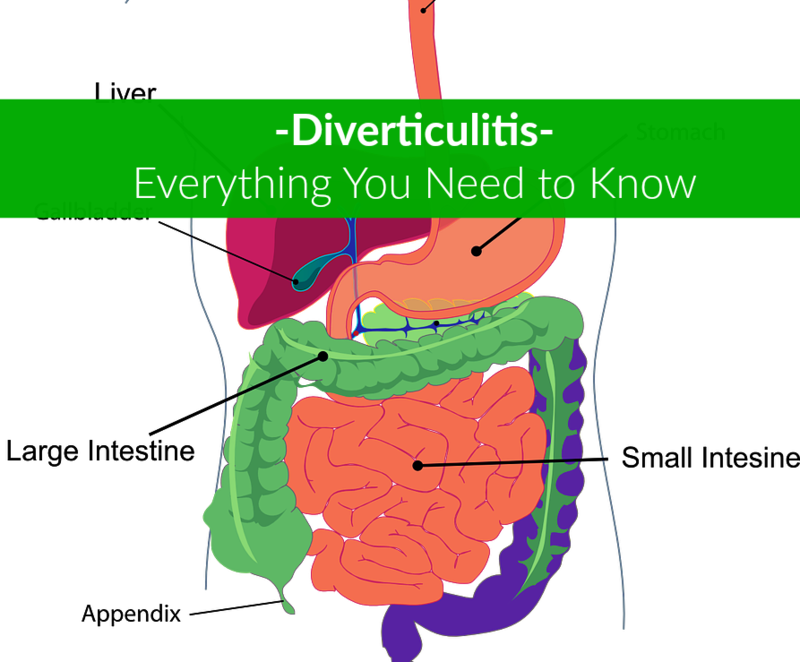 When diverticula actually tear, bleed, become inflamed or infected, the resulting condition is known as diverticulitis. The exact cause of verticulitis is unknown. Since diverticula are so common, they may simply be a result of aging. However, there are some risk factors that increase the chances you will go on to develop diverticulitis. Increasing age and diverticulitis go hand-in-hand. Obesity and lack of exercise can both contribute to diverticulitis. If surgery is required, obesity also increases the risk of complications. Smokers are more likely to develop diverticulitis than non-smokers. (3) Diet seems to be a factor, with a high intake of animal fat and low fiber correlated with verticulitis. Many patients also complain of bloating and excessive abdominal gas, and may also have a fever. When pressure is applied to the abdomen, the patient may complain of abdominal tenderness. The pain is most likely to occur on the left side of the abdomen, although in some patients – especially those of Asian descent – it may occur on the right. Occasionally the intestine will actually rupture and spill intestinal contents into the abdominal cavity, which can cause a severe infection called peritonitis. Verticulitis is often not diagnosed until the patient has an acute attack, although the presence of diverticula may be confirmed with a routine colonoscopy. Abdominal pain, which is one of the primary symptoms, can be caused by a number of conditions, so the doctor will need to rule out other possible problems. It can be harder to diagnose diverticulitis if the pain occurs on the right side, as a ruptured appendix causes similar symptoms. A physical examination is necessary and most women will also need a pelvic exam to rule out problems like an ovarian cyst or ectopic pregnancy. Blood, urine and pregnancy tests for women help check for other conditions and infections. Other tests may be used to rule out liver disease, pancreatitis or gallbladder disease. A stool test for those who have diarrhea is also typical. X-rays may be helpful to rule out other problems such as a kidney stone or ruptured appendix. A CT scan is often the definitive test, as it can actually show the diverticular pouches in the intestine. Treatment depends on both the symptoms and their severity. Mild cases of diverticulitis can often be managed with at-home treatment that includes rest, a liquid diet and a mild over the counter pain medication like acetaminophen. Some people find a heating pad or warm, moist compresses help relieve abdominal pain. Antibiotic treatment is one option for treating mild to moderate diverticulitis. 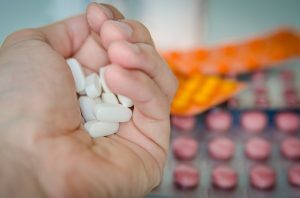 However, antibiotic treatment can upset the balance of beneficial bacteria in the gut, which may actually be a contributing factor to further diverticulitis attacks. At-home treatment is effective in most cases, but severe or complicated diverticulitis may require hospitalization and/or surgery. Intravenous antibiotics are used for severe infections and abscesses, and in some cases, an abscess may need to be drained by inserting a tube into the area. If the bowel is obstructed, or has actually ruptured or a fistula develops, surgery is the treatment of choice. (10) There are two surgical options: an open resection or a laparoscopy. An open resection involves a large incision in the abdomen, through which the surgeon examines and repairs the bowel. A laparoscopy is a less invasive procedure, with several small incisions into which special tools can be inserted. Both require a general anesthetic. The laparoscopy usually requires less recovery time and leaves small scars instead of one large one. With either technique, the surgeon may be able to remove the diseased sections and reattach healthy bowel segments. Occasionally, a colostomy may be required. In a colostomy, the surgeon cuts out the diseased sections of bowel and brings a section of healthy bowel out to the skin of the abdomen. The stool is then collected into a bag attached to the skin. 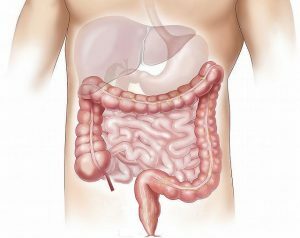 Once the bowel is healed, the colostomy can usually be reversed. Although there are no guarantees, experts have identified some strategies that may help prevent diverticulitis. Regular exercise helps promote regular bowel function and can reduce pressure inside the colon that may contribute to the development of diverticula. Thirty minutes of aerobic exercise a day is a good target. According to accepted medical wisdom, high fiber foods like fruits, vegetables, nuts, seeds and whole grains help prevent constipation. (11) They also keep the stool soft and make it pass through the intestines and colon more quickly, which prevents a build-up of pressure. Good choices to increase dietary fiber include cooked dried beans and other legumes such as peas, as well as artichokes, pears, berries, prunes, leafy greens and apples. Drinking lots of water helps prevent the fiber from actually causing constipation and softens the stool. Some experts also recommend probiotics – beneficial bacteria that thrive in the intestines. However, there isn’t any specific evidence that a high-fiber diet decreases the risk of diverticulitis. In fact, Konstantin Monastyrsky reports his research indicates a high fiber diet may increase the risk of diverticulitis. (3) Monastyrsky recommends less fiber, probiotics and retraining the bowel so you have a small bowel movement after each meal. Abdominal pain is usually an indicator of a problem. Diverticulitis is only one of the conditions that should be ruled out. Abdominal pain that lasts more than a day or is severe – especially if accompanied by other symptoms such as nausea and vomiting or a fever – is always a reason to see a doctor. Chronic constipation or diarrhea, while not urgent, do indicate a problem with gastrointestinal function and should be discussed with a health care professional. If you are vomiting blood or have bloody stools you require immediate medical care. Common in older people, this condition usually causes few problems for most. Self-management with diet, fluids and regular exercise may be all that’s necessary for many people who have diverticular disease and mild attacks can often be managed at home. When problems do occur, however, prompt medical attention is required. Contact a physician or go to the emergency room if you have severe abdominal pain, nausea, vomiting, a high fever or bloody stools.